Big Caribbean Cruise III was about to launch from St. Maarten — a cruise on a StarClipper ship in the British Virgin Islands with our favorite band — BIG HEAD TODD AND THE MONSTERS. More than 160 fans and band members looked forward to sailing through the beautiful BVIs, private concerts and jam sessions by the band members, days at the beaches and experiences of a lifetime. My dad mentioned to me about checking out Pack for a Purpose before we departed. I did so and contacted the trip organizer, Kevin Clark, who agreed that it would be okay to try to make a drop. 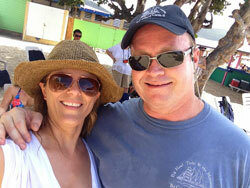 Kevin reached out to the folks at Necker Island and they were willing and able to help accommodate a donation. In no time, Kevin sent out an email about the donation. 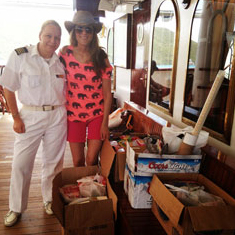 When we arrived near Necker Island I was astounded at the number of passengers who made a donation of school supplies to the Robinson O’Neal Primary School on such short notice. 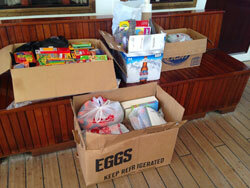 Four large boxes were picked up near our StarClipper ship. We were thrilled! Kevin says he plans to make Pack for a Purpose part of every BIG HEAD TODD AND THE MONSTERS trip going forward if he can. And I am hopeful that many passengers will start to Pack for a Purpose on other trips, as well. We were honored and thrilled to be able to make a difference. Special thanks to Kevin Clark of Local Knowledge Travel and the members of BIG HEAD TODD AND THE MONSTERS for making this happen on the Big Caribbean Cruise III in March of 2015!